Filters are how you can adjust the exposure, color, contrast, and style of your image in Aurora HDR 2018. The proper use of filters can significantly improve your image. 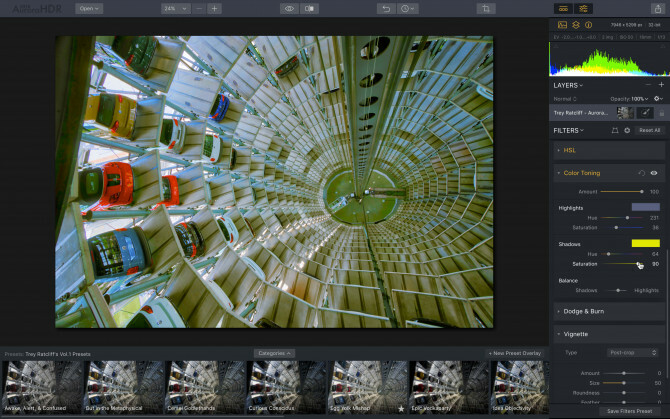 Each filter is designed to solve specific problems or enhance an image in a particular way. 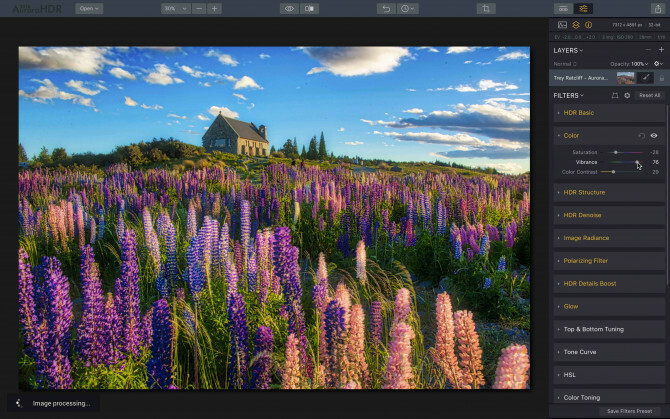 Each major adjustment tool in Aurora HDR 2018 is contained within a “control group” generally consisting of a header with the name of the tool, along with a set of sliders or other controls related to this tool. 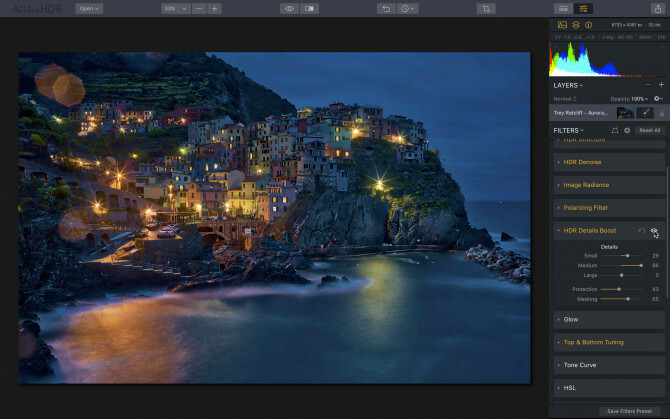 To help you get the most from Aurora HDR 2018’s filters, you’ll find a detailed guide below that explains the major features of each. Some filters have similar controls so you may notice that certain Filters have parts that perform similarly. Clicking on the header (the section name) hides and reveals this section. When hovering over a name, clicking on the reset arrow returns all the sliders of this section are restored to their default state. To cancel this action, you can choose Edit > Undo. 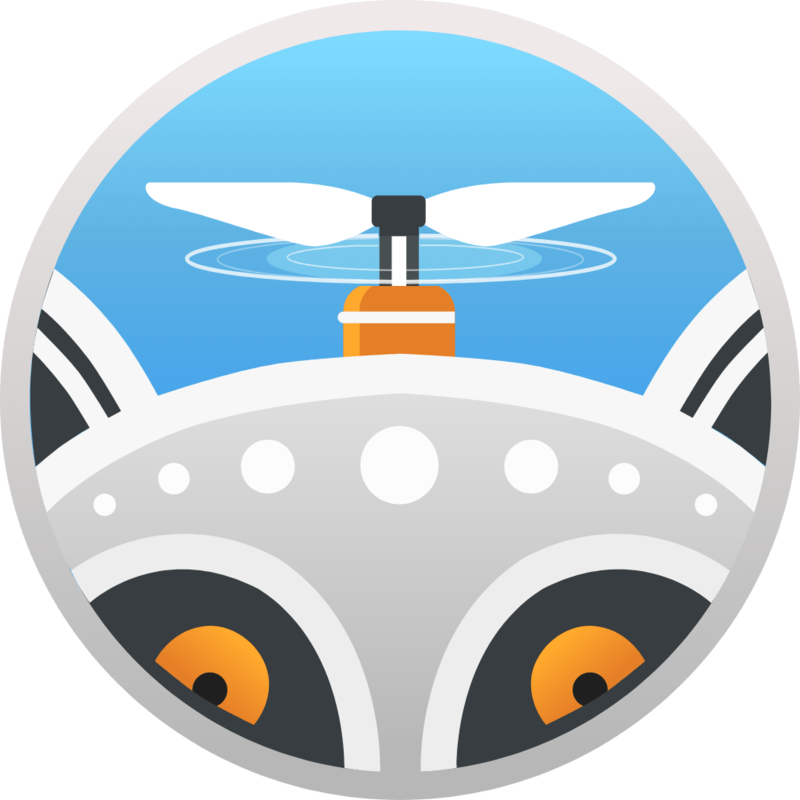 When hovering over a name, clicking on the visibility icon (eyeball) enables or disables the tool, allowing you to view the image without the effect of this tool. 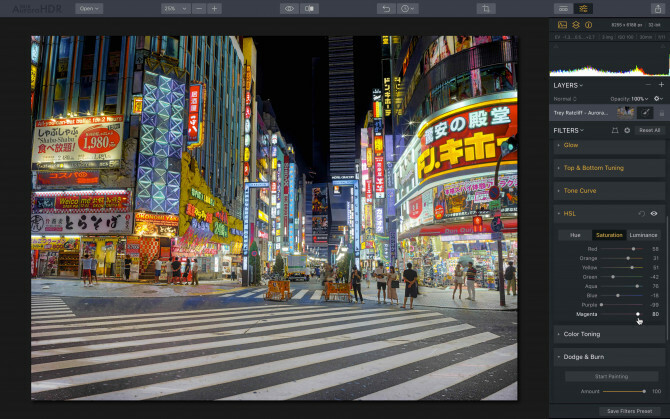 This tool gives you control to adjust the Tone Mapping process. Tone mapping (or “compression”) converts the wide dynamic range image into one that is more narrow and can be displayed on a computer monitor. 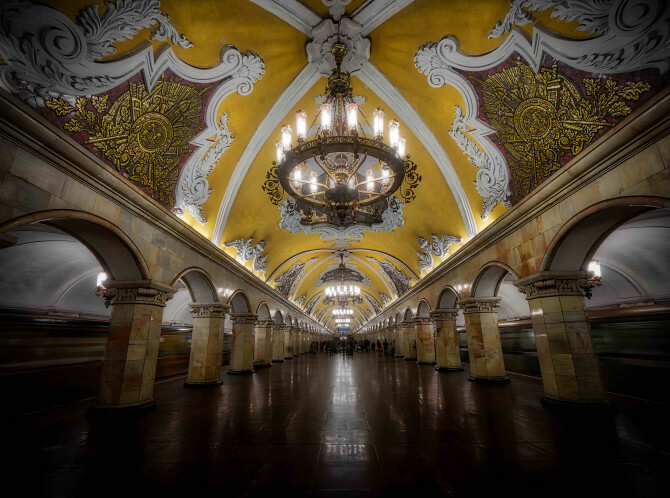 It’s a great place to start your HDR journey. White Balance. Use the White Balance preset list to choose from a variety of presets that are similar to a camera’s white balance menu. Exposure. Adjusts the global luminance of the image. Moving this slider to the left results in a darker image (reduction of exposure value). Moving this slider to the right results in a brighter image (increase of exposure value). HDR Enhance. The HDR Enhance slider is a single slider that adjusts a variety of controls including lighting effects and detail, and includes a special ability to configure balanced image brightness without getting completely white or completely black areas. This has the effect of making the image less realistic and more classically the look a lot of people associate with HDR. Moving the slider to the left lets you decrease the settings, achieving a more realistic look. Smart Tone. This slider adjusts the overall brightness of image properly. When moving to the right, the image is more vivid, but it does not work when bright areas become white, as in the ordinary exposure. And when you move the slider to the left, the image becomes darker but there are no completely black areas. This is a very powerful and balanced image brightness tool. Blacks. Sets the black point of the histogram or black tones in the image. Moving the slider to the right, black tones become brighter and the histogram compresses to the right. Moving the slider to the left, black become darker and the histogram stretches to the left. A recommended workflow is to start with a light touch with Exposure and Contrast, then Smart Tone. Then proceed to setting Shadows and Highlights and finally fine tune the contrast of the image using the Whites and Blacks sliders. HDR Enhancer is the successor of traditional clarity. Just like the clarity adjustment, the new HDR enhancer brings out the details and textures on photo. But also takes your image much further, making it more sharp, vivid and eye-friendly. This is one of the most helpful sliders in Aurora HDR 2018 — even a subtle boost will lift almost any HDR photo. The Color section gives you complete control over colors and color saturation of the image. There are three useful controls that each affect the colors of your image in a different way, Be sure to experiment with each. Saturation. Adjust the color saturation of the image. This is a standard slider, similar to many other applications. Moving the slider to the right will cause the colors in the image to become more saturated, while moving the slider to the left will cause the picture to become black and white. Vibrance. This slider is a "Smart Saturation” control. In general, its effect is similar to Saturation with the difference that it increases less vibrant colors stronger and has a weaker effect on more vibrant colors. This allows you to get more realistic and less saturated colors the picture. This slider can be used in conjunction with the Saturation to enhance the secondary colors. Color Contrast. Enhances the color contrast in the image. Color contrast specifically refers to contrast that is created between differences based on colors (vs. luminance). The strongest is, the more contrast between primary and secondary colors. Vibrance can be used in conjunction with Saturation to make secondary colors pop a little more. Application of Color Contrast is also recommended to obtain realistic contrast and color saturation of the picture. This slider is very helpful, especially if the color temperature is incorrect — make any corrections here at the very start of editing, before further image adjustment is applied. This tool allows adjusting of image detail and clarity. 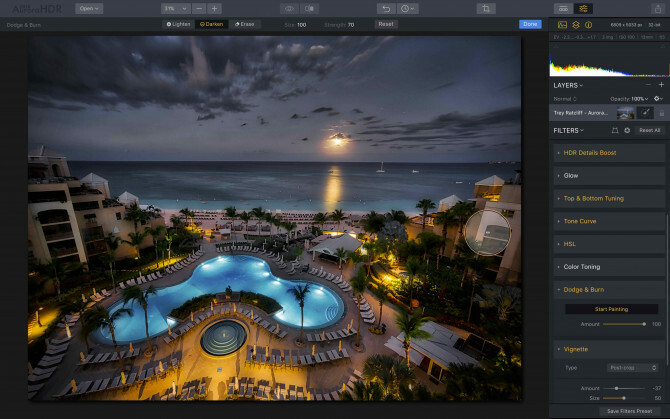 Using this tool you can get a classic HDR effect with great detail or get a smoother picture with less detail. This is the main tool to increase micro-contrast of the image and visualize more details in the image. 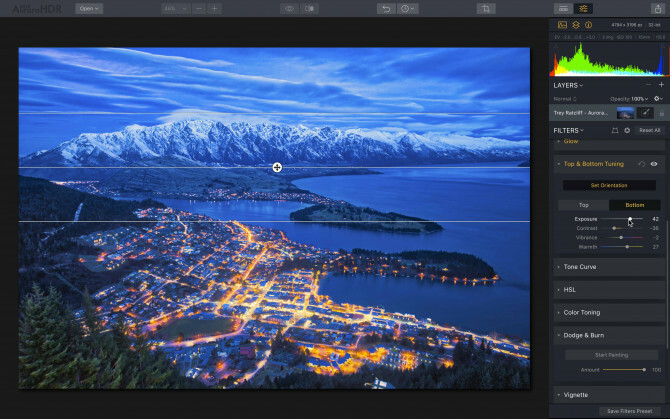 Increases image detail by revealing the structure and texture of the surfaces in the image. This enhances the image and hidden details appear. Amount. The strength of the effect. By moving the slider to the right, the amount of visible detail in the image increases. Moving the slider to the left will cause the image to lose detail and flatten. The “zero state” in the middle means that the amount is not applied by default. Softness. Controls the overall softness of structure and textures in the image. Moving the slider to the left will cause parts of the image to become less smooth and more unrealistic. This produces the so-called classic view of the HDR effect. Moving the slider to the right, on the contrary, the details become more global and the image is more realistic. This is very useful slider to adjust realistic details. Boost. Adjusts the overall display of details. When moving the slider to the left, the images will become more realistic and “calm.” Moving the slider to the right will accentuate details and make the image more unrealistic. This section amplifies micro-detail within the image. These are small details that form the surface of any object in the image. They can further enhance details of the image and provide a more vivid artistic HDR effect, however it can also make the image very noisy. Softness. Affects the general "softness" and realism of the photo. Moving the slider to the left will cause the image to become very finely detailed and unrealistic. Increasing the values of detail can cause an increase of noise in the image. In case of high Clarity values, ghosting of the image may appear and so we do not recommend raising the value above + 50. In most cases, HDR Detail adds a lot of noise in the image. To get a realistic HDR, do not apply HDR Detail. This tool slightly blurs the image and reduces the amount of noise and any image artifacts caused by merging multiple exposures together. However, special algorithms also attempt to preserve edge detail if possible. It can also be used to reduce the amount of noise which may have been caused by increasing detail within the HDR Structure section. Amount. The strength of reduction of small noise in the image. Moving the slider to the right will increase the noise reduction. Note: the Amount slider must be moved above 0 to notice results. Smooth. 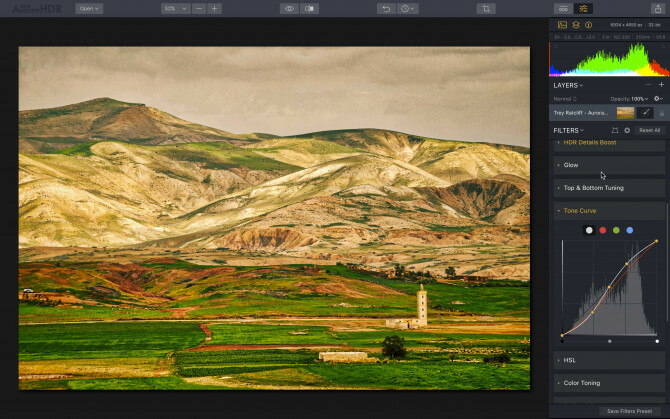 This slider allows you to make the image more blurred which has the effect of creating a less detailed or noisy image. Boost. Adjusts the overall display of noise. When moving the slider to the right allows the full effect of the de-noise control to be shown. It’s helpful to apply this tool not to the entire image, but locally: Create a layer in which you’ll apply the effect, and then, using a mask, brush only the area where the effect should be applied. For example, if the noise is very noticeable in the sky, then, using a mask, apply the effect to the sky. This effect should never be applied to the entire image — otherwise too much detail will be lost. This tool provides a soft glow effect to the image, adding more vibrant colors with an increased global contrast. Moderate use of Image Radiance can give you more interesting, entertaining “dreamy” images. Amount. Effect strength. For a moderate effect and a more realistic image, keep the values in the Amount to +40. If the Amount value is 0, then the effect is not applied. Move the slider to the right to increase Amount. Smoothness. Controls the softness of the effect. Brightness. Controls the brightness of the effect. Shadows. Controls how the affect modifies darker areas of the image. A higher value will brighten dark areas. Vividness. A useful way to adjust the color saturation of the effect applied to the image. At a low setting, this effect will give the image more contrast and can increase color in the image. Use the Vividness slider for better control. On a camera, a polarizing filter can provide more color depth and cuts atmospheric haze, resulting in richer, bluer skies. The same holds true with the Polarizing Filter in Aurora HDR 2018. The effect will produce deeper blue skies and more contrast in clouds. With a light touch of this filter, almost any landscape image can be improved. Amount. Effect strength. If the Amount value is 0, then the effect is not applied. Move the slider to the right to increase Amount. It is not recommended to use this tool on night photos or images with no sky in them. Most times, keeping the effect intensity under +50 will yield the best results. This filter allows you to control the details of the image, making it more clear and sharp, or vice versa, softer. This tool is useful for improving the overall quality of the image as well as to increase the quality of the images that will be used in high resolution, such as for printing. Increasing the sharpness can also compensate for lower quality optics used to make the captured image. Innovative technologies allow the HDR Details Boost adjustment to improve image sharpness without increasing digital noise or creating unnatural ghosting or halos in the image. This is a very powerful tool to improve the quality of images. Small. This sets sharpness of fine details. At 0, the effect is not applied. Moving the slider to the right will intensify the clarity of small details, while moving to the left, on the contrary, somewhat washed out the fine details. Medium. This sets medium-sized parts sharpness. At 0, the effect is not applied. Moving the slider to the right increases the sharpness, while moving the slider to the left - decreases it. Large. This sets sharpness of global contours of objects in the image. At 0, the effect is not applied. Moving the slider to the right increases the sharpness, while moving to the left — decreases. Protection. This slider will protect fine details from being negatively adjusted. Masking is a separate slider. This slider controls the zone of detail amplification. When moving the slider to the left, the number of zones increases and the image becomes more detailed. When moving to the right, the number of granularity zones is reduced. Optimal masking comes from a setting in the range from 30 to 70. A moderate increase in Small and Medium has positive impact on the sharpness and quality of any image. There is often no need to demonstrate all details in the image. In bright areas, such as the sky and light clouds, unnecessary detail will reduce realism. The dark areas often need more detail. Therefore, it is always better to strengthen Details in the shadows than lights. Should you desire an image that is soft, you can achieve that effect by moving the Detail sliders to the left. By default all sliders are at 0 and at that setting have no effect. The effect is only visible after moving sliders to the left or right. The Glow tool adds auras on the picture. The effect finds the brightest areas of an image and adds bright halos to it, having the effect of shining. This effect can be used to give the photo a "romantic" view or create a fog effect. This effect looks good on night photos to accentuate glow halos around light sources such as street or building lights. Amount. Sliding this control to the right increases the strength of the glow around areas of high brightness. Smoothness. This slider controls the size of halos around bright areas. Moving the slider to the right increases the size of the halos. Brightness. This slider analyzes the image and determines where halos will be created, letting you choose those areas of brightness that should be lightened up. Moving the slider to the left ensures areas of maximum brightness will be selected. This locates the glow just around the brightest areas. Moving the slider to the right will include darker areas to glow. Moving it all the way to a value of 100 will light up the entire image. Warmth. By default, a neutral white color is used for the glow in the middle of a halo. This slider allows you to select a specific hue for the glow, according to the cool-to-warm spectrum shown on the slider. This tool is a simulation of an analog filter to specify different brightness in the picture vertically - Graduated Neutral Density Filter. This effect is widely used in landscape or architecture photography with a distinct horizon. The effect flexibly and separately controls the brightness and other aspects of the top and bottom of the image. This enables you, for example, to lower the brightness of the sky and raise the brightness of the foreground. Thus, your image can be significantly improved without resorting to creating layers and masking. Note: The explanation of controls are the same for Top & Bottom sections of this panel. Set Orientation. Click this button to interactively drag the position of the filter. Drag the Move arrows to position the Transition Zone. Place your cursor next to the Move tool and it changes to allow for Rotation of the Transition Zone. Expand or contract the Blend handles to adjust the rate of transition from top to bottom. Expand the bars to increase the Blend value, making the transition between the values of Top to Bottom wider. Decrease the spread to decrease the blend value creating a sharp transition between Top and Bottom. Exposure. This controls the brightness of the image. Moving the slider to the left will make it darker and to the right brighter. Contrast. This adjusts the contrast of the image. Contrast is the difference in luminance or color that makes objects in an image distinguishable from another. Vibrance. This slider increases less vibrant colors stronger and has a weaker effect on more vibrant colors. This allows you to get more realistic and less saturated colors the picture. Warmth. This Adjusts the hue of the effect towards the warm end of the scale. This tool is best suited for landscape shooting with a strong horizon line. With it, you can lower the brightness of the sky at the top, and then, using Shift / Rotation / Blend orient the strip of brightness transition between heaven and earth approximately at the level of the horizon. Tabs. You can make a curve adjustment to all channels equally or to an individual channel (such as to blue to emphasize the sky). Just click on the White dot for a global adjustment or use the Red, Green, and Blue dot to adjust the corresponding channel. Sliders. At the bottom there are sliders that let you adjust black and white points of the histogram (the leftmost and rightmost sliders), as well as the middle bend of the curve (the central slider). Many, many articles are available on the Internet for information on using this tool. Generally moving a slider down will darken that channel and moving it up will lighten the channel. Experiment and have fun! This tool allows for separate adjustment of the hue, saturation and brightness of the main colors in the image. There are three tabs present in the Color Filter panel. Each tab contains sliders for Red, Orange, Yellow, Green, Aqua, Blue, Purple, and Magenta values. Hue. A set of sliders to adjust the hue or basic color shades of your image. Sliding the control further to the right results in a more intense hue. The sky is mostly blue in the photos. Therefore, lowering the brightness of blue colors in the image can cause more dark and deep blue of the sky. Reducing the tone for some colors (move the slider to the right in Saturation tab), and leaving it for the other can cause a dramatic effect on the selective color in photos. Raising the yellow color (move of the slider to the right) can significantly improve color saturation of autumn foliage on the photos. This tool affects the color toning of images. The color shade in the Highlights area is for the light areas in the image and the Shadows area color shade is for the dark areas. The effect can significantly increase the visual appeal of images, and is often used for creative artwork or to simulate analog photography techniques (e.g., a vintage look). Amount. Controls the overall intensity of the filter. Sets the color for the bright colors in the image. Hue. Move the slider to target the corresponding Hue that you want to modify. Saturation. This slider lets you choose the saturation level of the Highlights color shade. If the value of saturation = 0, white is used and toning is not noticeable. Therefore, to use color, you must choose both Hue and Saturation. Sets the color for the dark tones in the image. Saturation. This slider lets you choose the saturation level of the Shadows color shade. If the value of saturation = 0, white is used and toning is not noticeable. Therefore, to use color, you must choose both Tint and Saturation. Balance. Sets the balance between light and dark tones. If you move the slider to the right, more tones are considered bright and therefore the color chosen for the bright areas (Highlights) are emphasized in the photo. Move to the left and more tones are considered dark and the color chosen for dark tones (Shadows) are emphasized in the photo. Thus it is possible to balance what color you want to have for toning the image. The best results are achieved if you use the opposite colors to the bright and dark areas, for example: yellow and blue, green and purple. Use warm tones for light colors and cool ones for the shadows. Only light or only dark areas of the image can be toned. To avoid toning of certain areas, simply set Shadows or Highlights saturation parameter to 0. The color is not applied. To Dodge and Burn, click to expand the Dodge & Burn section in the Filters list. If you press and hold the Option key and click on a slider value in the sidebar, moving the cursor to the left and right will let you set the values of the slider with high accuracy. Slider sensitivity is higher than with its normal movement. This allows you to fine-tune to small numeric values. A Vignette darkens or lightens the edges of your image. This is quite an old technique to emphasize the accents on photos. The effect typically leaves the central area unaffected while the edges are shaded or lightened. 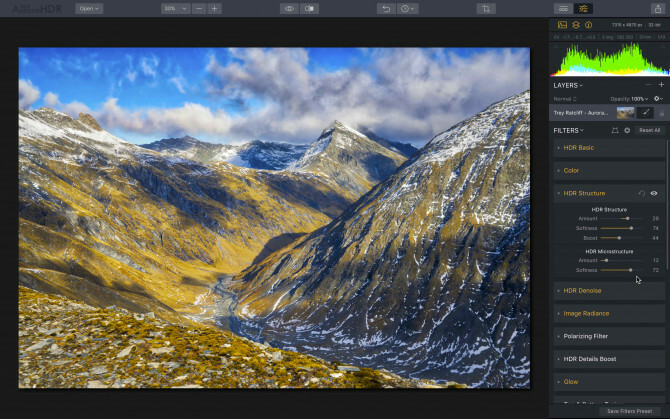 Aurora HDR goes further by letting you place the center point of the vignette anywhere in the image you like. Type. You can choose to calculate if the vignette should respect cropping of the photo or use its original borders. Amount. Strengthens the darkening around the edges of photos. In position 0, the effect is not applied. Move the slider to the left side of the picture to give more shading to the edges, while moving the slider to right will brighten the edges. Size. This is the size of the obscured area. Moving the slider to the left will increase the area of darkening. Moving the slider to the right will reduce the area of darkening. Roundness. This slider changes the shape of the shaded area. Feather. This slider sets the smoothness of the transition between the area of shading. Inner Brightness. This slider increases the brightness in the central region which is not affected by shading. It allows you to create a contrast effect. Place Center Button. This control adjusts the center of the effect. By default, the center of shadowing effect is in the center of the image. With this button you can shift the focus from the center of the image to any other place. Click on the button Place center which will turn the cursor into a “target sight.” Click this anywhere on the image to set the new center of your shading effect. 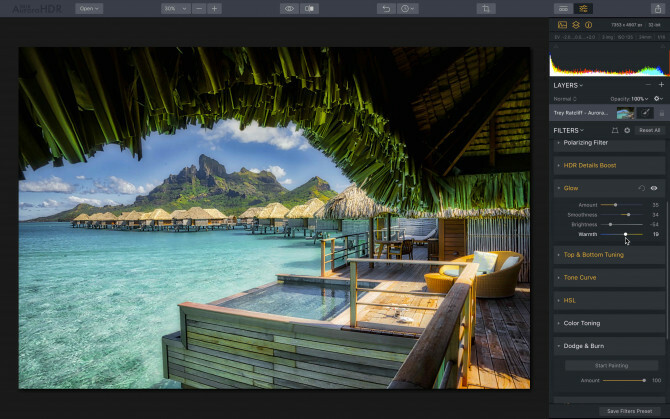 This tool allows you to highlight key points in the photo, making it more interesting. A slight edges shading always provokes the viewer's eye to consider the lighter central part of the photo. You can also move the center to focus attention on some objects that are not in the middle of the picture. For a realistic picture, don’t lower the Amount below -50. As a rule, this effect is used only with darker shading. Highlights are rarely used except for some vintage looks.